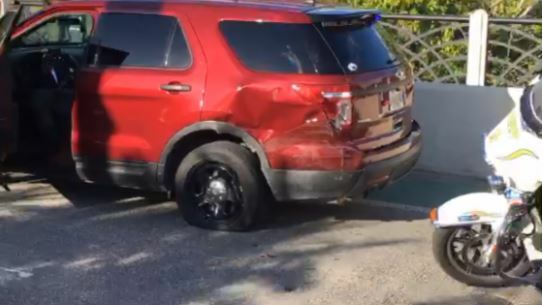 EAST NAPLES, Fla. A Collier County deputy’s SUV was damaged in a crash Thursday, the sheriff’s office said. The wreck took place around 6 p.m. near the intersection of Bayshore and Bayview drives. A gang-unit deputy was driving an unmarked maroon Ford Explorer as he responded to a report of people trespassing in the woods near a bridge, according to the sheriff’s office. Once he was on the bridge, the deputy pulled over and got out of the SUV, but he kept the emergency lights on, the sheriff’s office said. He went into the woods, where he heard the crash. A black Mercedes Benz failed to yield and slammed into the SUV, the sheriff’s office said. The 25-year-old driver didn’t see the SUV until it was too late because a Toyota driving in front of him swerved at the last moment, he told deputies. Charges are pending against the driver, but he was not arrested, the sheriff’s office said. By law, motorists must move over and yield to emergency vehicles that have their emergency lights on.